We're not quite re-acclimated to these temps. I heard about the walk home from school for a while. The kids walked through the front door dripping wet and wanted a drink ASAP. I had already gotten all the ingredients out for smoothies. What perfect timing if I do say so myself. Cool and refreshing on a hot afternoon. Success! Do you have these ingredients on hand? If so, you're all ready for a tasty treat. And healthy to boot. Little Man had 4 glasses. This recipe comes from the kitchen of my sister, Rena Redmon. I think my family has got to be some of the healthiest people I know. They are always cutting foods out of their diet and looking for healthier alternatives. If it's green and pungent and looks like it could walk away I tend to shy away. But this one is a winner. Chalk full of the good stuff. You could add a variety of other fruits instead or in addition to. It's a versatile recipe. If you missed my pulled pork sandwiches with slaw or oriental salad click here. I've made something quite similar a few times. It is a yummy drink and so easy to change up which I love to do. We make the same kind of smoothies but without the vanilla yogurt, yummy yummy! i heart smoothies so much. way to go with the rules momma! Hmmm, you had better pull out a parka...your snickering may bring some cold weather your way. When it does, I hope I'll be enjoying one of your lovely smoothies in warm weather! This looks yum and healthy - thanks to sister Rena. Are you looking for recipes? You might like my healthy chocolate balls (if you'll pardon the expression.) They're on my health blog: http://sickofbeingtirednomore.blogspot.com. If you like it you can reproduce it here if I can put your smoothie there (full blog crediting of course.). What do you think? Stay warm. The weather hit a humid 90-something here yesterday. This sounds like the perfect treat for such weather! Mmmmm. I love smoothies! They're a regular item on the menu over here. I need to stock up on frozen fruit to do smoothies. My kids love them! Yummy! 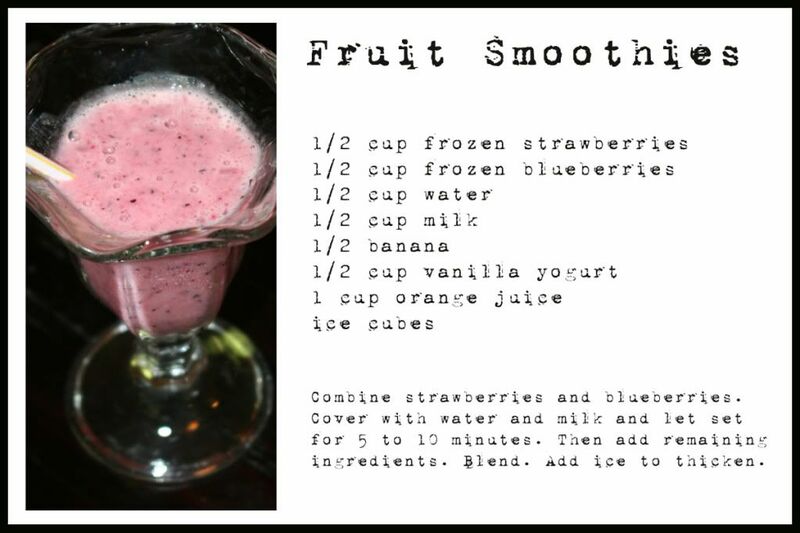 Since I'm trying to lose weight and be good, I've been living on smoothies so I'll definitely try this recipe out! YUM! You are totally a mind reader as I was just browsing smoothie makers because my blender went belly up after a margarita binge when we had company. lol And I am tired of spending $5 for one smoothie. going to keep all these ingredients on hand all summer. Can you make this a meme? I'd participate...I have tons of easy recipes I could include! Looks delish!!! Why must the weather be so crummy here!! I used to make smoothies like this all the time and somehow fell out of that habit. Thanks for the nudge. They are sooo good. We LOVE smoothies around here. 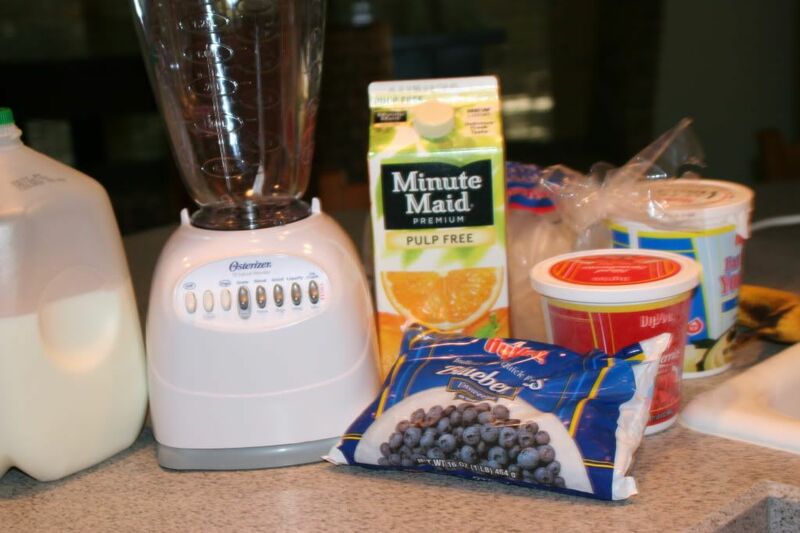 We get our Magic Bullet out every night, and whip up delicious fruit smoothies. It's great for the immune system too! Thanks for a great recipe to add to our list! YAY. Yum! Love smoothies but haven't had any recently...will have to correct that! Nothing better than tried and true recipes that the whole family loves! Thanks for sharing. Yummy..we have these all the time. If you want to get extra crazy add a scoop of ground flax. The kids don't even know it and they get a good dose of omega 3's. I'm sneaky like that! Im stopping by from SiTs to day hi. I also saw your thread on the forum about photographs. I think yours are great and your profile pic is beautiful! Sorry this is off topic to your post! I love your typewriter font. Yummo! Smoothies are a favorite around here too.